Just as it says on the label Chicken & Sons is a chicken shop, but it’s not your ordinary chicken shop. This place is shabby chic, white tiles and monochrome fittings; a really nice place to spend a lunchtime. 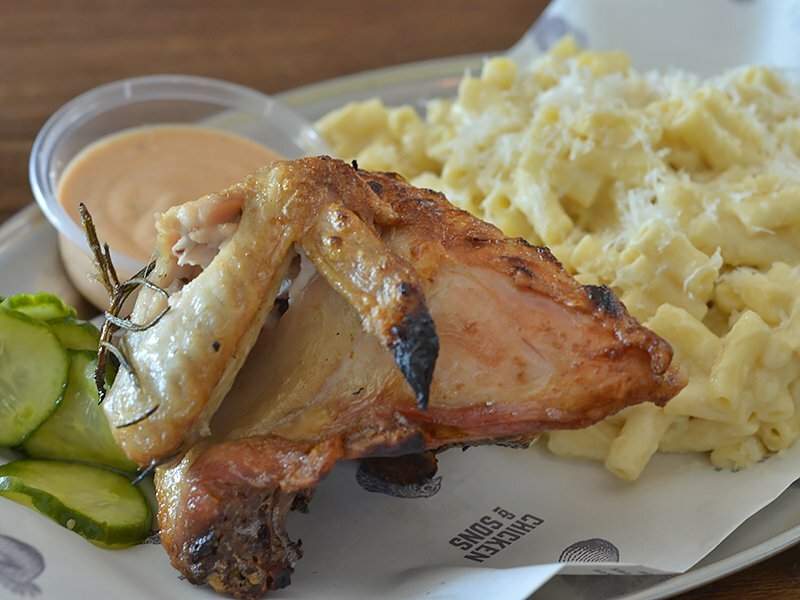 I wouldn’t necessarily head to Chicken & Sons for the chicken; it’s the groovy, funky interesting things that it sells as sides and accompaniments that makes this place different. And they do it at a reasonable price. 1/4 chicken with the truffled mac ‘n’ cheese.. The marinades had a promise of “spice” such as chipotle aioli (medium flame) and shake up jerk (rather fiery) but they left me a little disappointed. Not that the sauces didn’t taste great, but there was no “fire” from their depths. I’d have liked a bit more heat, as spice goes so well with chicken. I had the “shake up jerk” which reminded me of my mum’s tomato chutney, with a little spice added. All exotic spices and onions wrapped around a green tomato flavour. I reckon it would be a brilliant sauce for a burger. I think you can grade a takeaway like this by its chips. So many places make an undercooked soggy mush. Not Chicken and Sons; their beer battered chips were crisp and fresh. Perfect to go with my chicken. However, their chips pale in to insignificance when you taste their truffled mac ‘n’ cheese. I reckon it would be worth making a return visit to these chaps just for mac ‘n’ cheese! Hard to describe, but a certain tartness added to a real homely dish. A great contrast of flavours. 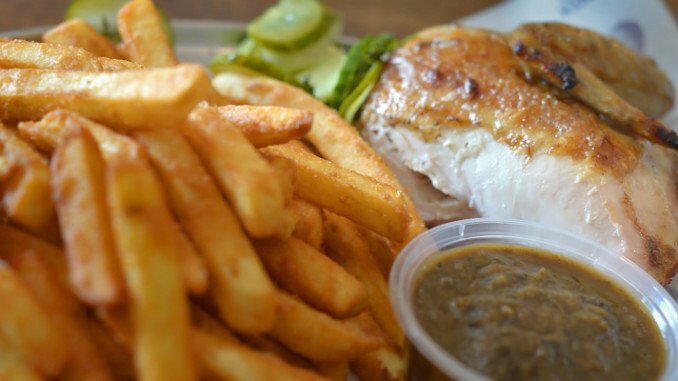 Run by Adam and Mark, Chicken and Sons is a brand new addition to the clamour of Chatswood. Chicken & Sons is at the wrong end of the shopping area, almost opposite the RMS office (the old RTA) but it’s worth the three minute walk to get there. Our meals were under $15.00 each including drinks.